A major auction of antiques and fine art – 700 lots – will take place on Tuesday, 28th May in support of conservation work at St Fin Barre’s Cathedral, Cork. The auction is being held in Fota House and is being conducted by the renowned Sheppard’s Irish Auction House of Durrow, Co Laois. Viewing dates for the auction at Fota House are Saturday – Monday, May 25th, 26th and 27th, with the auction itself starting at 10.30am sharp on Tuesday May 28th. Lots received include art – paintings, pictures and prints – some rare pieces of Cork and Limerick silver, jewellery and a small amount of fine wines and spirits. The auction will also feature a number of valuable novelty items. 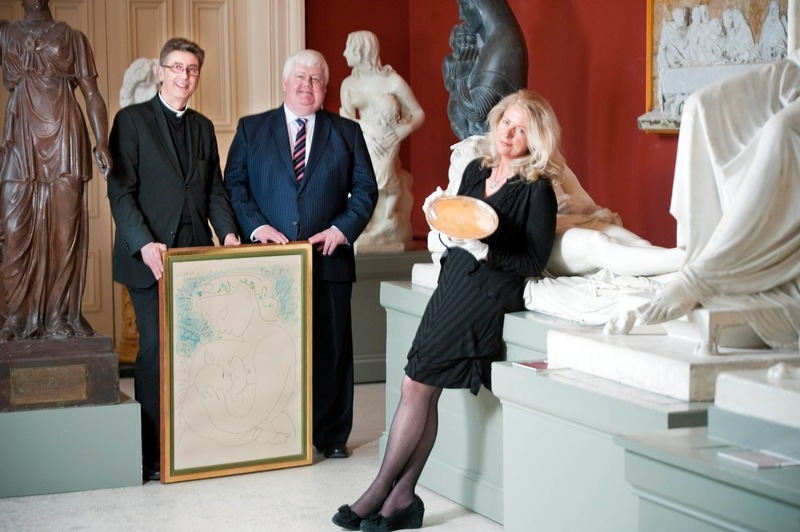 At the recent launch of the Bid for Saint Fin Barre’s Auction in the Sculpture Gallery of the Crawford Gallery are l-r, the Dean of Cork (the Very Reverend Nigel Dunne), John Bowen (Chairman of the Auction Committee) and Virginia Teehan (Auction Committee). This entry was posted in Cathedral, Fund-Raising. Bookmark the permalink.